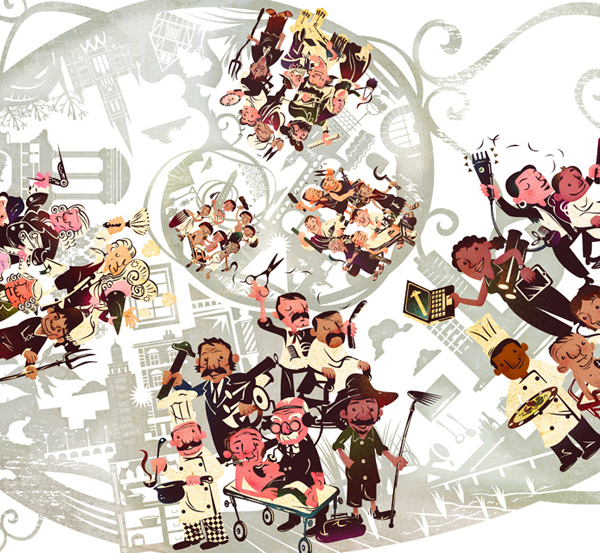 “(R)Evolution of Work”, a double page spread illustration created for an educational books series about History from Ática Publishing House. The book chapter was titled “Time and Work” and tells us about how professions have evolved since the ancient times. If we could look at people working while traveling through time we could see this evolution… And this is what this illustration is all about: A travel along a timeline where we can see a group of people, each person representing a profession, evolving and changing, starting from antiquity until our own time.